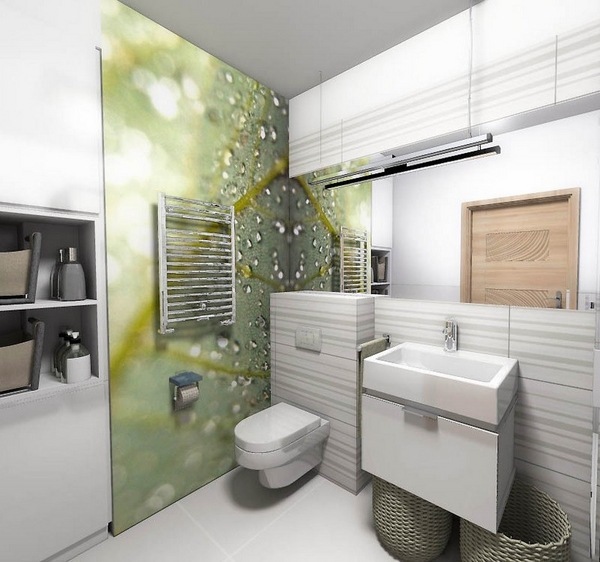 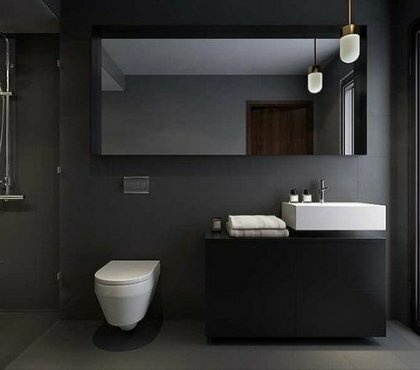 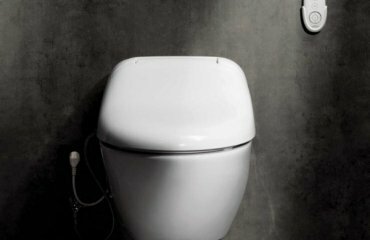 Small bathrooms are always a big challenge – they need a careful planning and efforts to find suitable space-saving furniture, to select tiles or wall paint and so many other issues that decoration is completely overlooked. 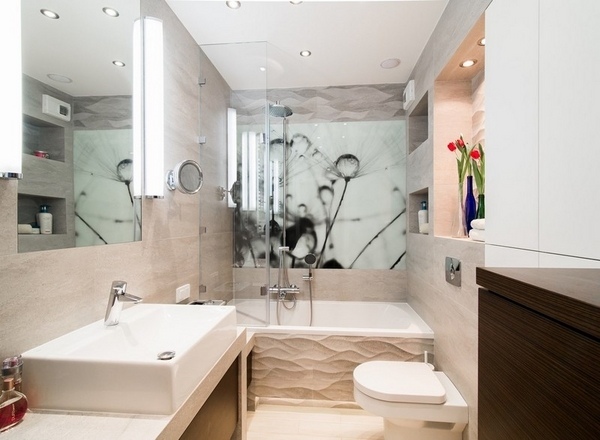 Many people want to try something original when decorating their bathrooms and painting and tiling are not quite inspiring to them. 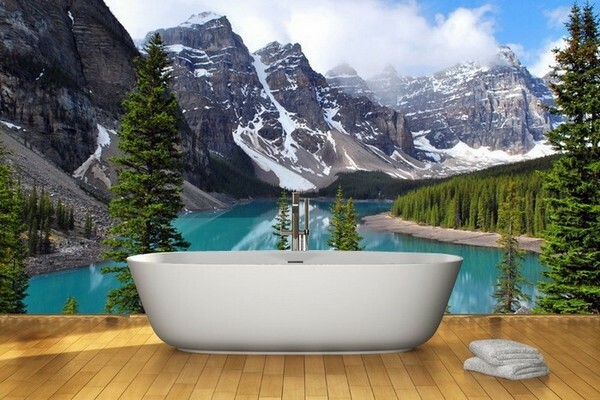 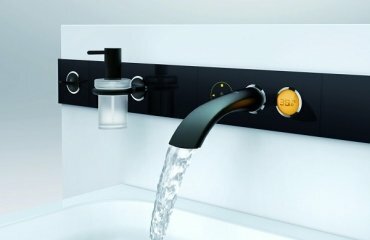 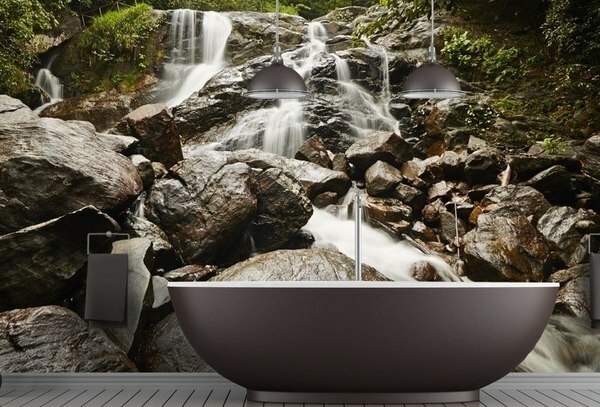 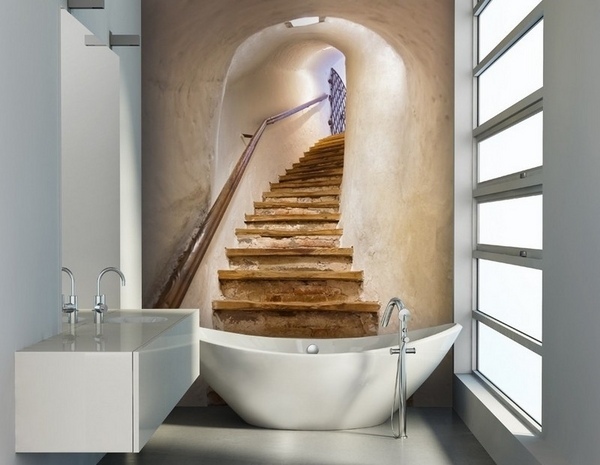 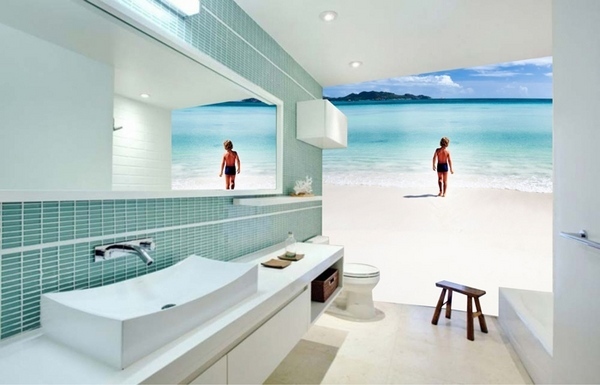 We will show you 50 fantastic small bathroom decoration ideas with wonderful photo wallpapers, which create amazing optical illusions. 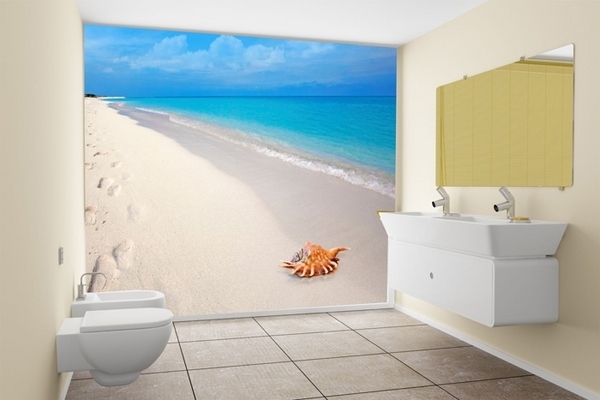 Photo wallpapers are available in a plethora of colors, patterns, and textures and will add the style that you want. 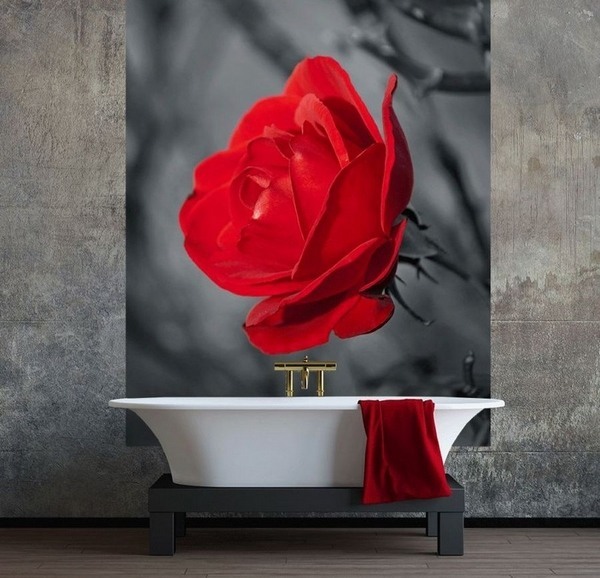 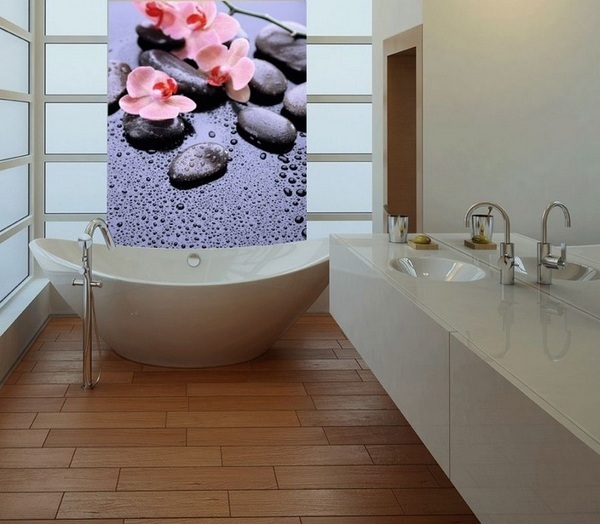 The creative small bathroom decoration ideas in the gallery will show you how to use photo wallpapers and mirrors to make a tiny place look bigger. 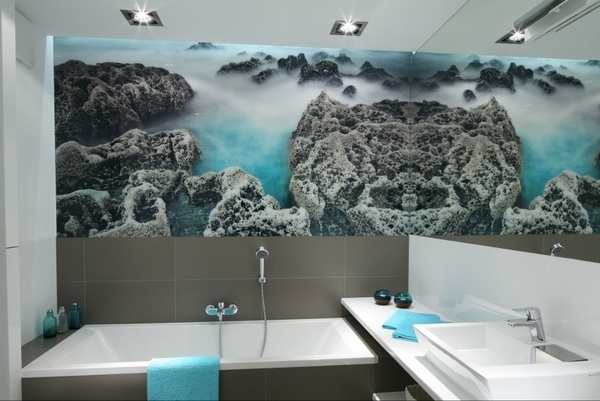 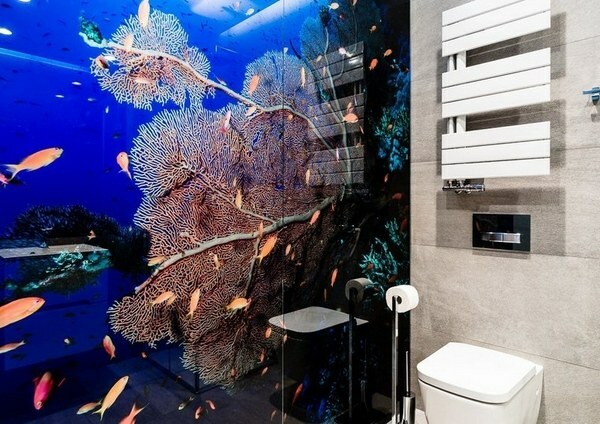 With a mirror and photo wallpaper with natural patterns an effective optical illusion can be created and you can observe your dream vacation tropical island, for example, while taking a shower or a bath. 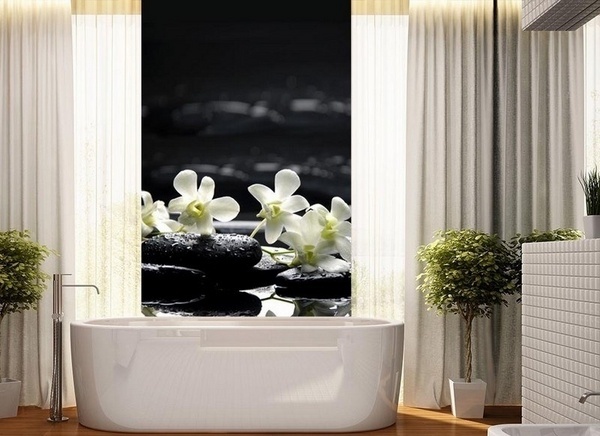 Beautiful lagoons, beaches and waterfalls or images of flowing water are among the most popular choices as they relax the eyes and senses and provide a comfortable atmosphere. 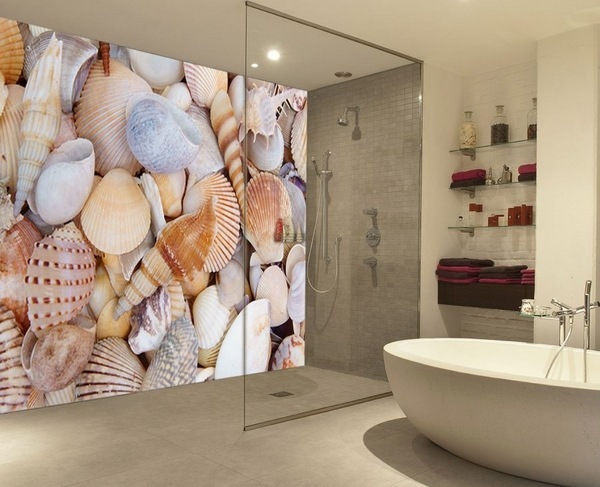 Wall and floor tiles in warm colors create the perfect background and the wallpaper stands out. 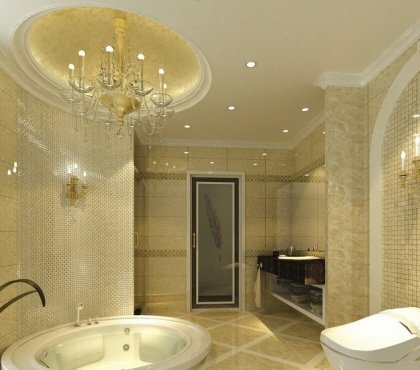 Accessories in accent colors will add the finishing touches to the interior. 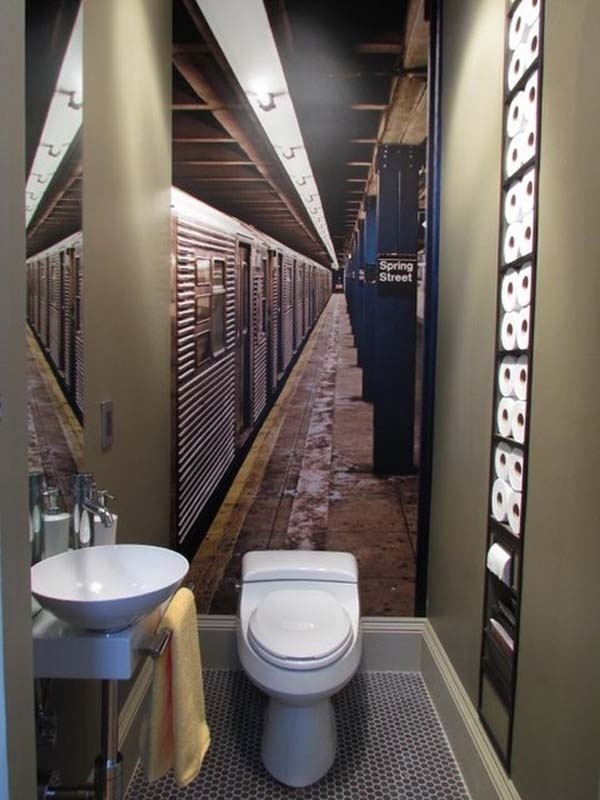 Small bathroom decoration ideas – why choose photo wallpapers? 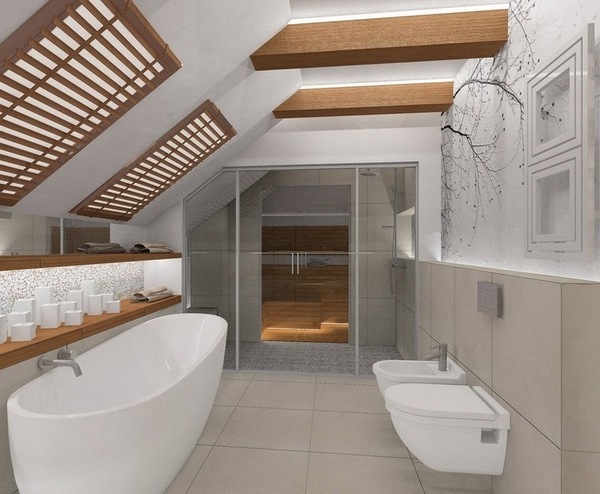 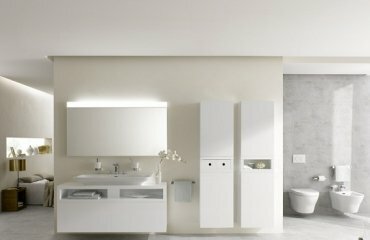 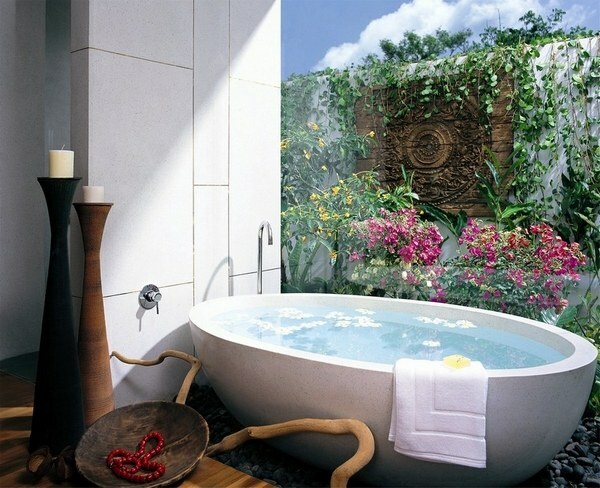 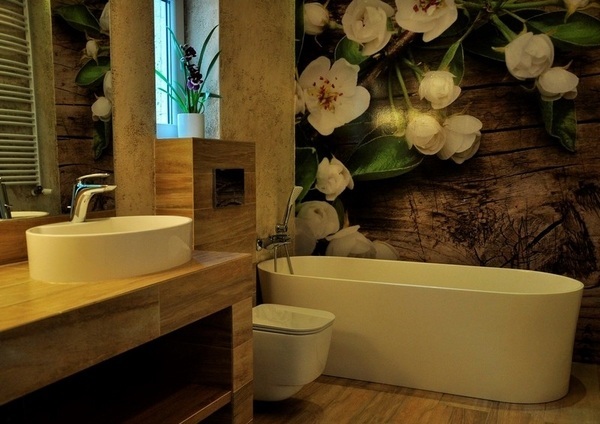 The bathroom is one of those intimate spaces where we can relax after the hustle and bustle of the working day. 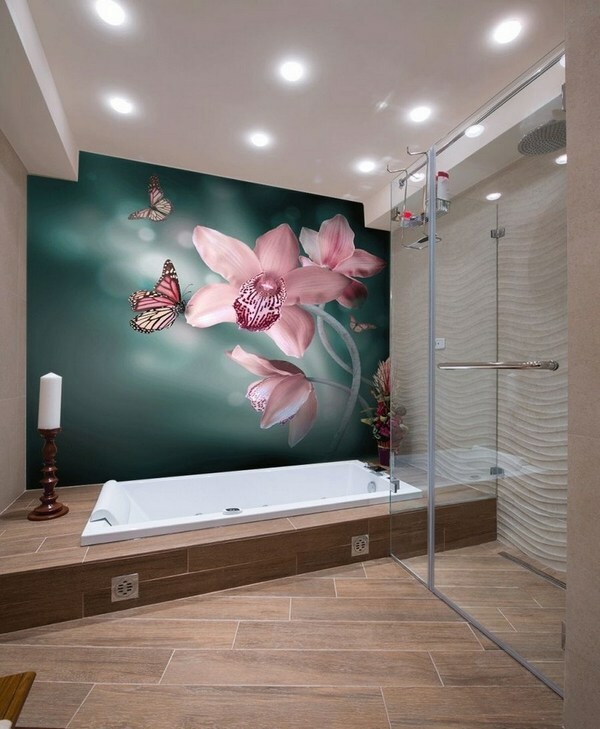 A photo wallpaper for the bathroom with an interesting design is able to transform a functional space into a beautiful relaxation room. 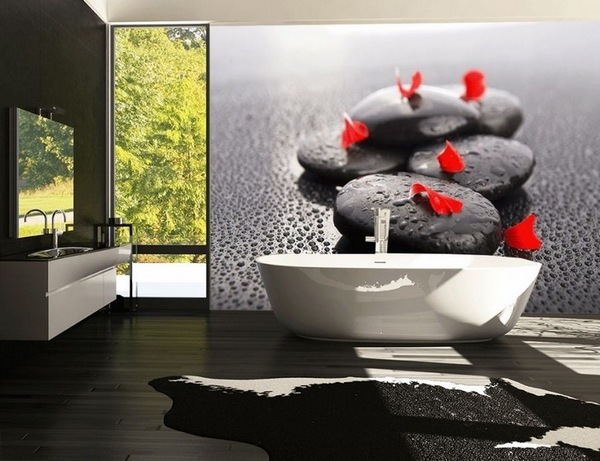 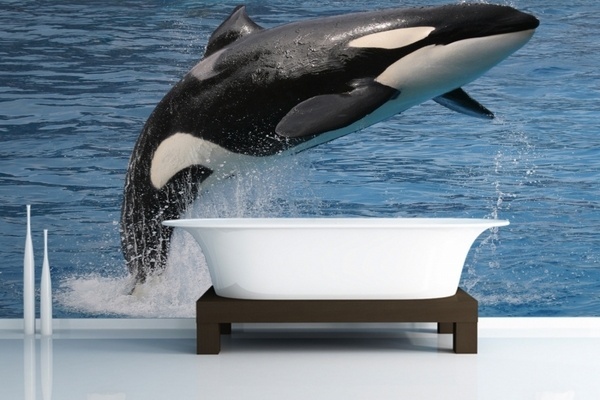 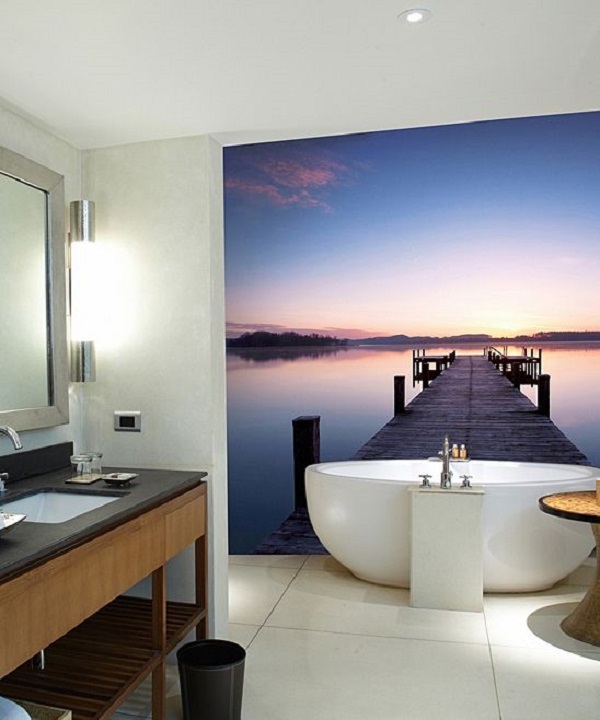 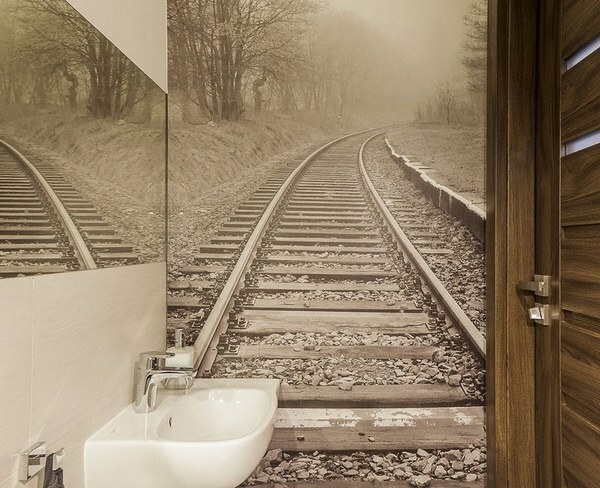 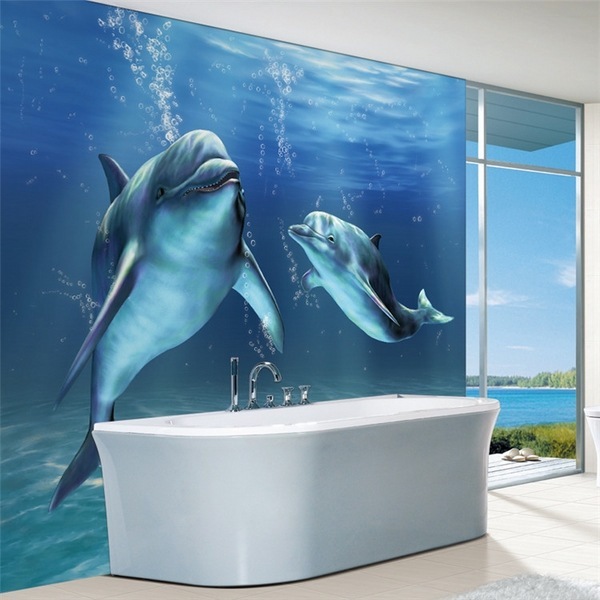 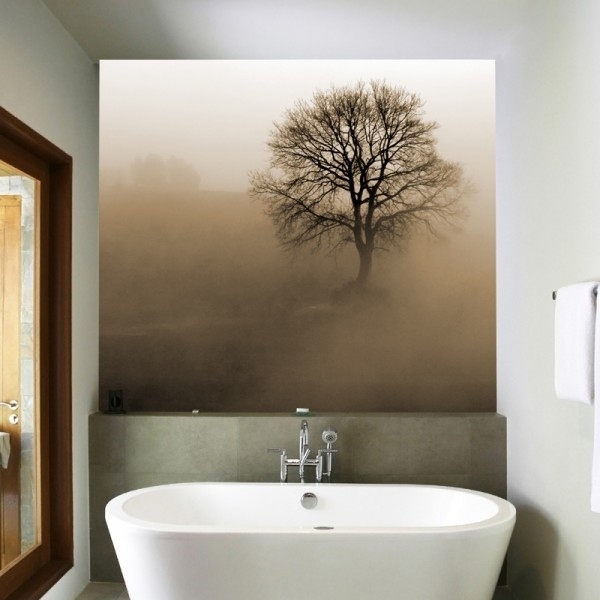 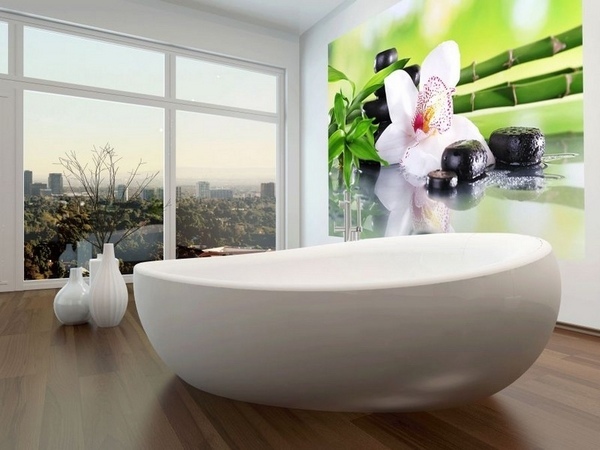 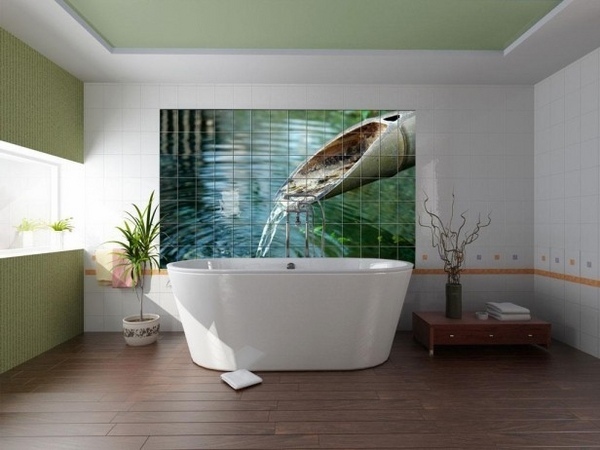 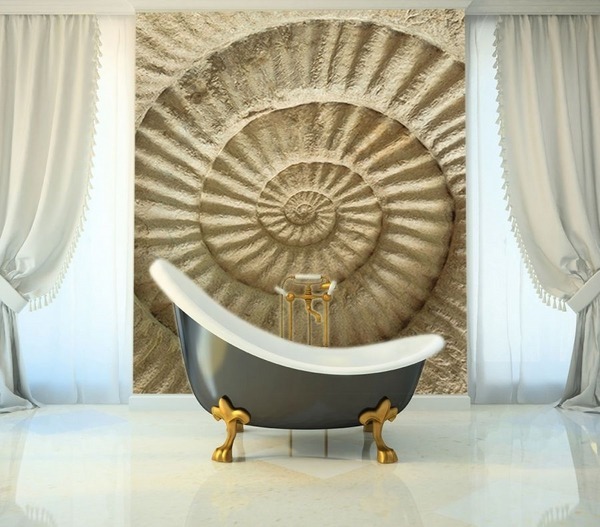 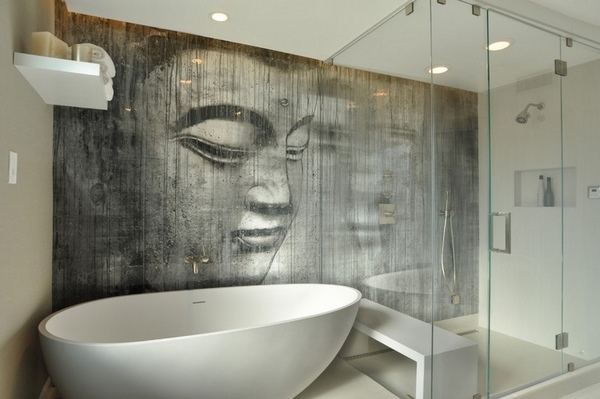 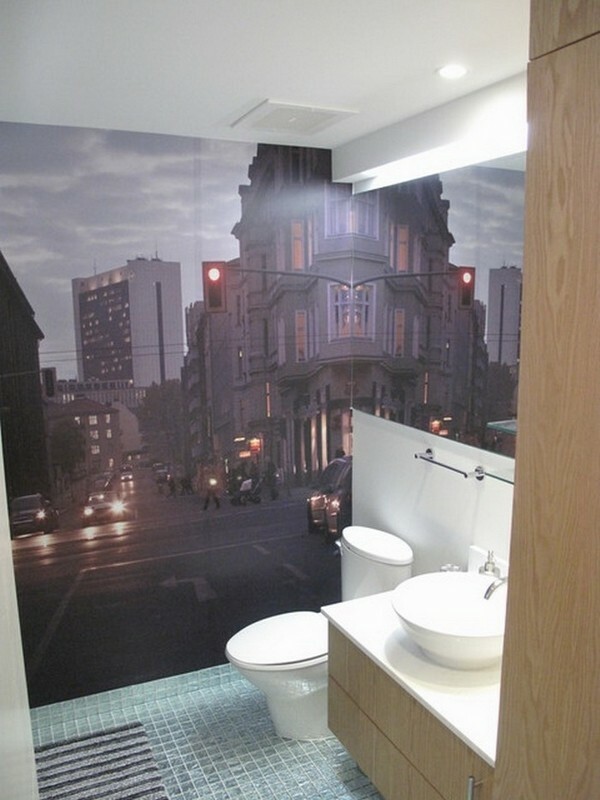 Photo wallpapers are a good option, a quick and inexpensive way to change the interior design of the bathroom. 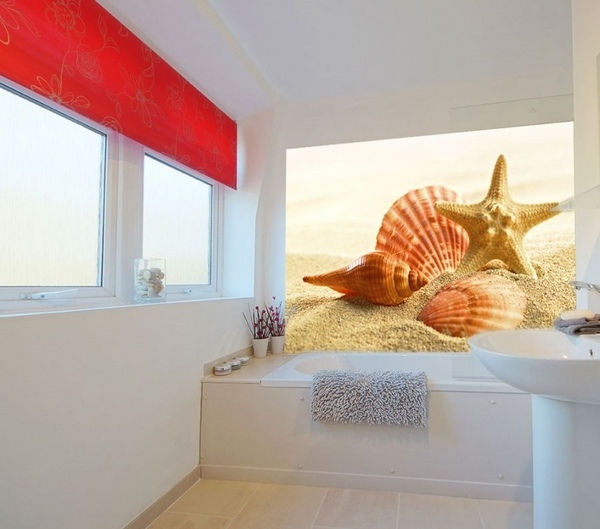 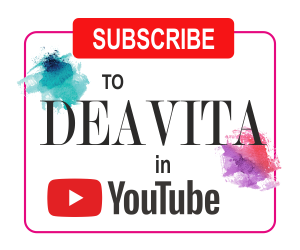 Looking at the small bathroom decoration ideas you will see how a the appearance can be transformed in just a few hours and you can have a custom decoration as per your personal taste. 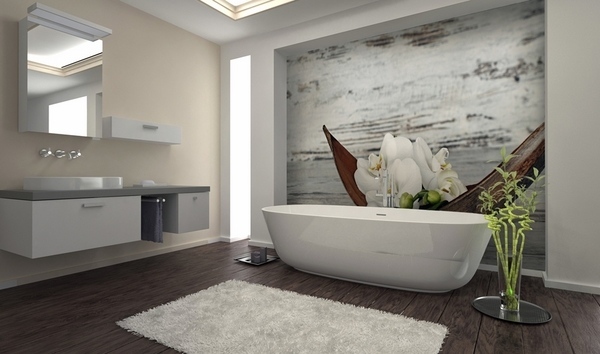 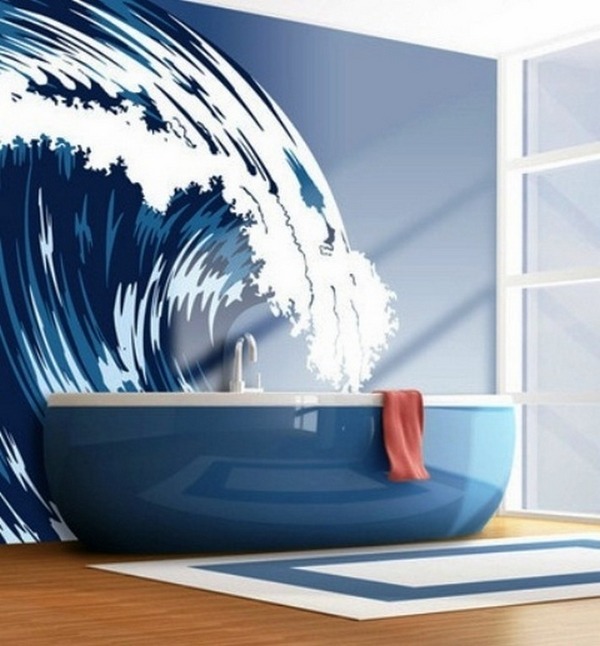 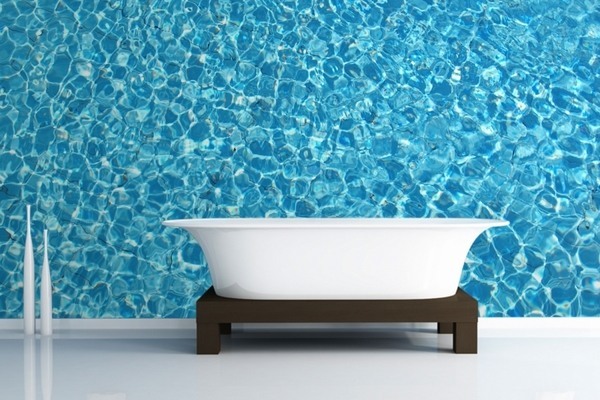 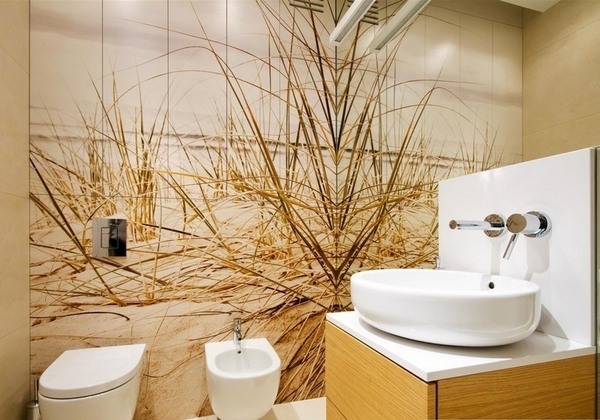 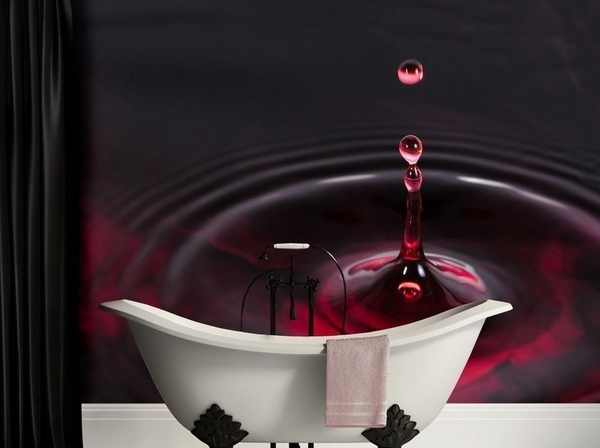 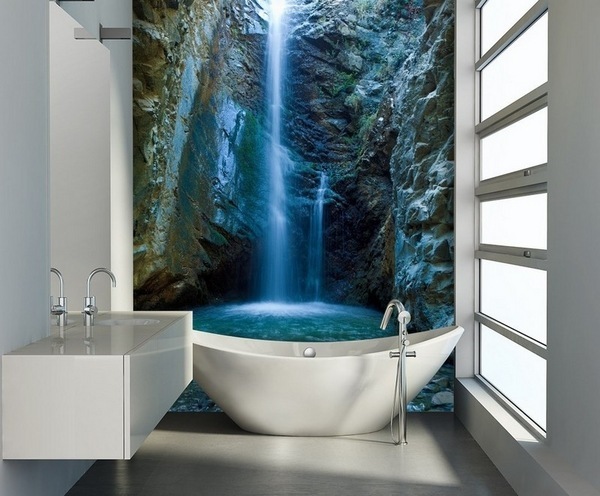 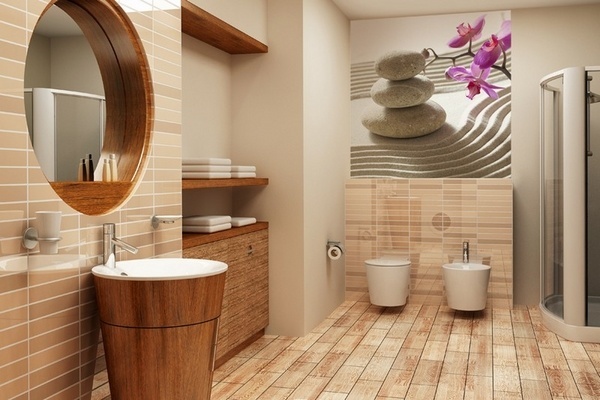 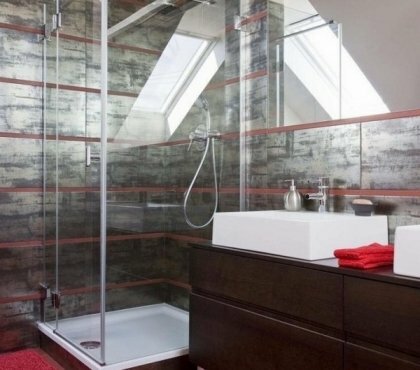 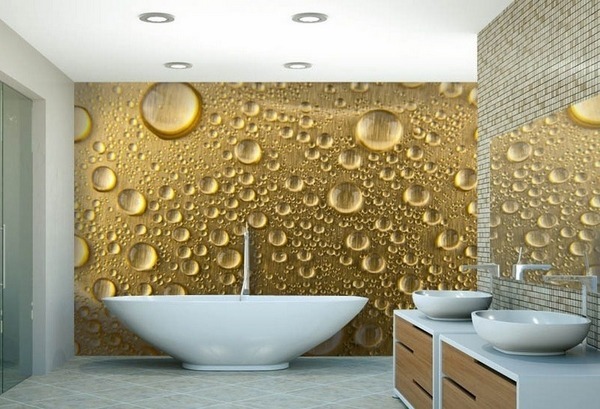 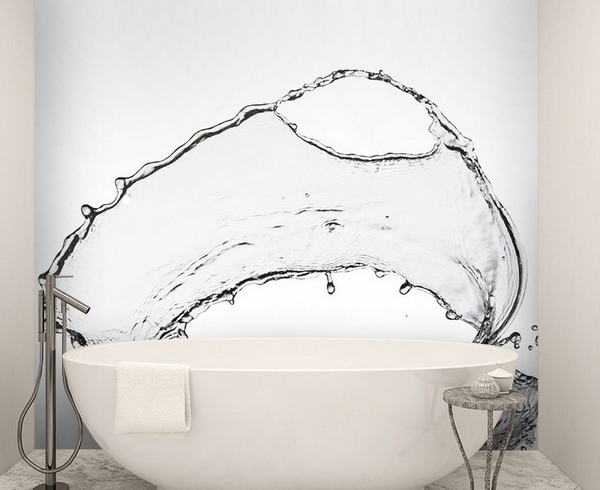 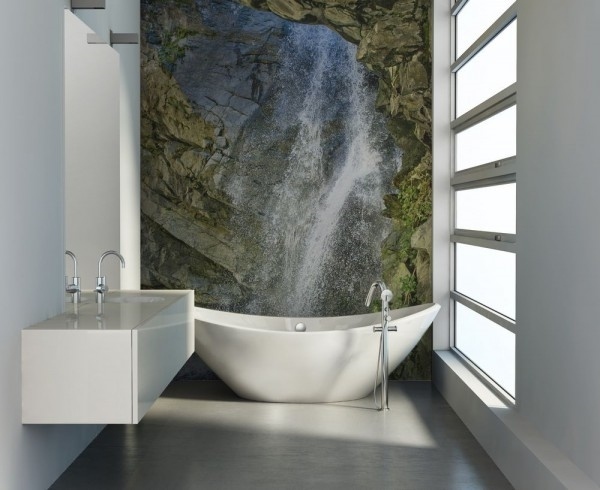 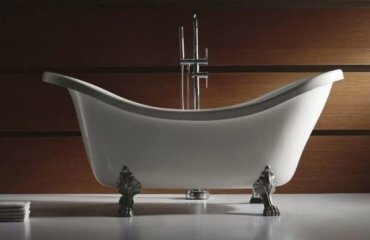 Bathroom wallpapers are water-resistant and will last for quite a long time. 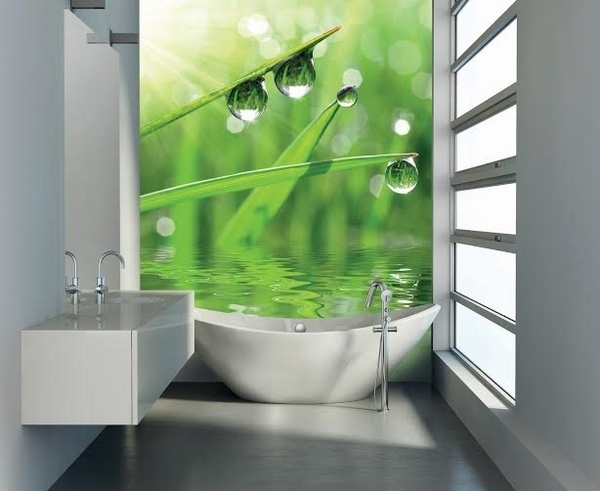 They can be installed behind the bathtub or on the wall in the shower cabin, if you have no free wall. 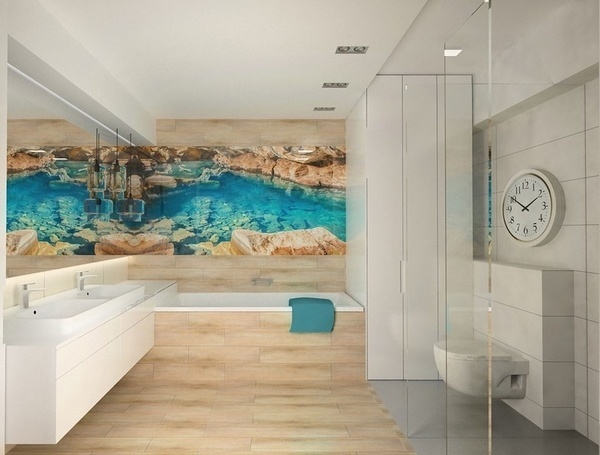 Bright cheerful colors always cheer up, and the choice of certain images will visually enlarge the space. 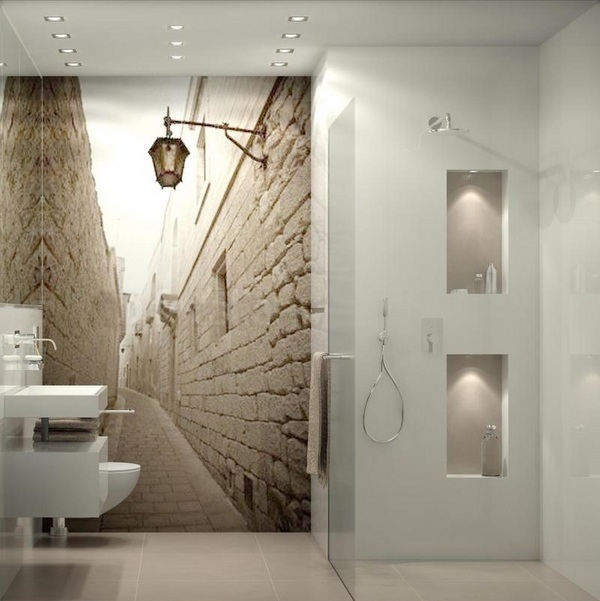 Especially in a small area, the illusion of depth and width is important for a good impression. 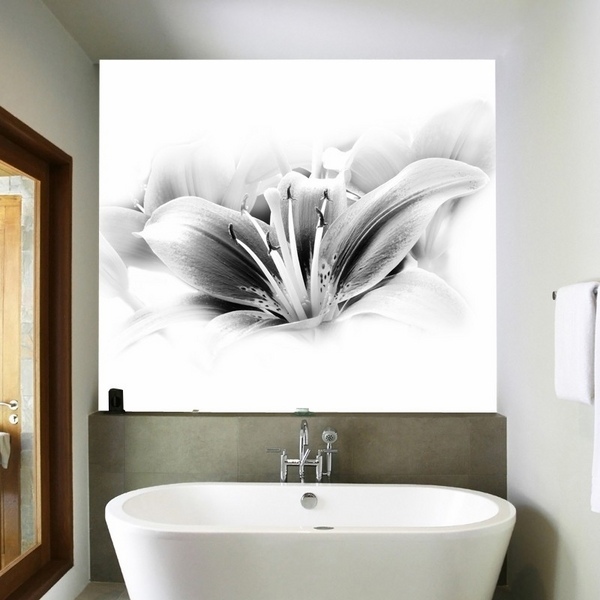 Flowers, landscapes, mountains and forest views – those have the best effect and create a feeling of spaciousness. 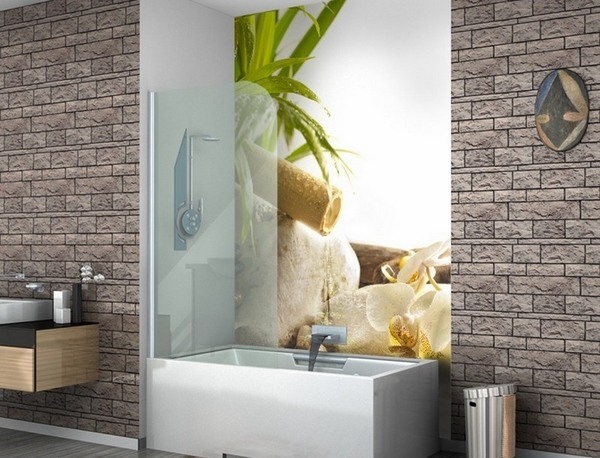 Despite the fact that wall tiles are the most popular and the most familiar material bathroom wallpaper are a cost effective option which can save money, but also bring a variety of non-standard ideas of interior. 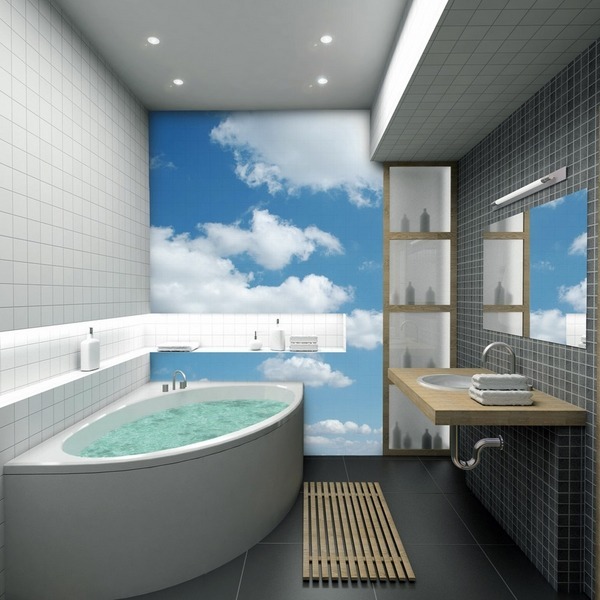 The low cost is undoubtedly an advantage and you can plan a DIY project for the decoration of your bathroom which will take a few hours. 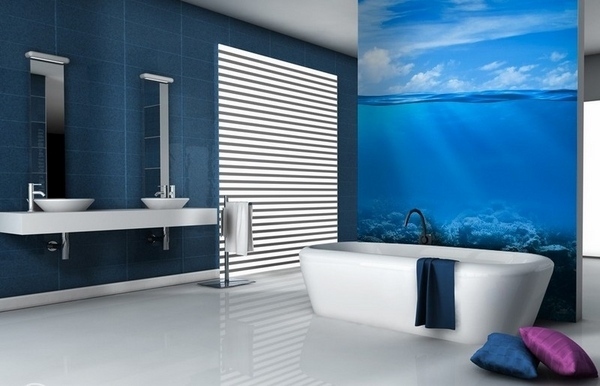 In addition, the possibility to change the decor at any time is appealing to many people. 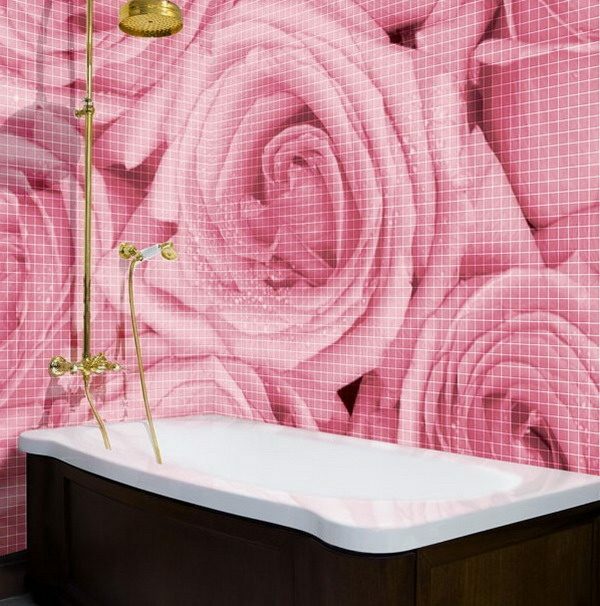 Choosing the color, pattern and texture of a wallpaper is much easier choosing wall tiles.